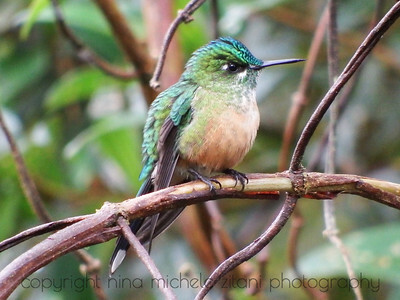 The female long-tailed sylph hummingbird is every bit as beautiful as the male ("Aglaiocercus kingi, family Trochilidae). Cabañas San Isidro, Cloud Forest, Ecuador. 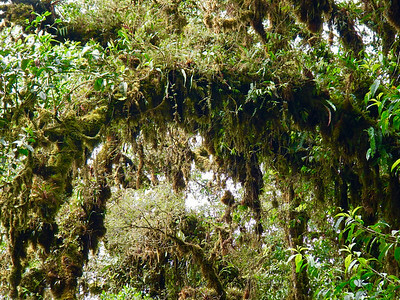 Moss and other epiphytes cover the branches of most trees in the area. This habitat - the arboreal bryosphere - is home to a surprising diversity of tiny animals including molluscs, earthworms, arthropods and more. This shot was taken from the Guacamayos Ridge Trail, also known as the Inca Trail. According to local lore the Inca used the trail to walk from the lowlands to Quito. A beautiful image; an unfortunate result of human encroachment into the cloud forest. Roads are deathtraps in more ways than one. They heat up faster than their natural surroundings. Reptiles and amphibians are attracted to the heat, then run over by passing vehicles. The butterflies are feeding on the fluids of a dead toad. After this photo was taken they too may have been run over by a vehicle. 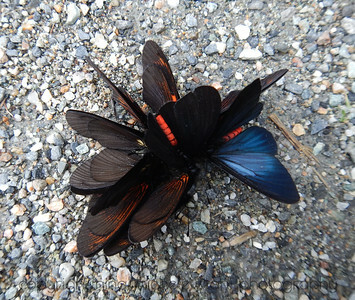 Squashed butterflies are not an uncommon sight on this gravel road. Cloud Forest, Ecuador (butterflies, family Nymphalidae, genus "Actinote"). Liverworts are ancestral plants, and they are closely related to mosses. This species is an epiphyte, and a fairly common member of the arboreal bryosphere in this part of the Ecuadorian cloud forest. 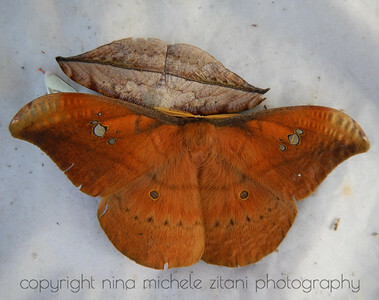 Cloud forest, Ecuador: A wild silk moth (bottom: "Copaxa andensis", family Saturniidae) and a leaf-mimic geometrid moth (top: genus "Oxydia") in the morning at a light trap. These moths would not normally associate in this way. A light trap the night before this photo was taken lured them to a white sheet, allowing me to study them without causing them any harm. 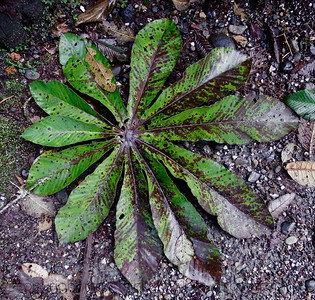 The ground layer of the rain forest is dark, and some plants have adapted to the low light conditions. The leaves of this ground-dwelling species have a three-dimensional surface which results in more light-gathering capacity. This adaptation allows the plant to gather sufficient light to survive. The Megaloptera is an order of insects that comprises lacewings, fishflies, and dobsonflies. 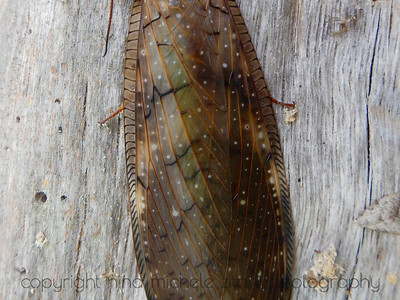 This image shows the beautiful wings of a female dobsonfly. A large insect, about 4 inches in length. 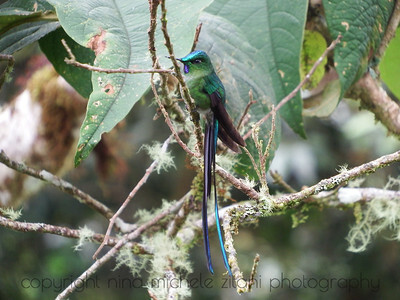 The first time you see a male long-tailed sylph it's an OMG moment. Words cannot convey the experience. "Aglaiocercus kingi", family Trochilidae. 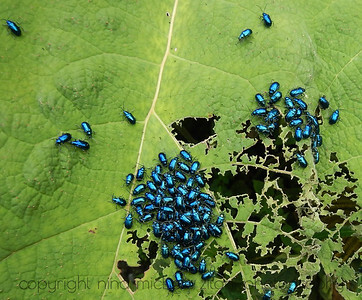 There are hundreds of species of leaf beetles (family Chrysomelidae) in the Amazon rain forest; adults and larvae feed on living leaves of their host plants. 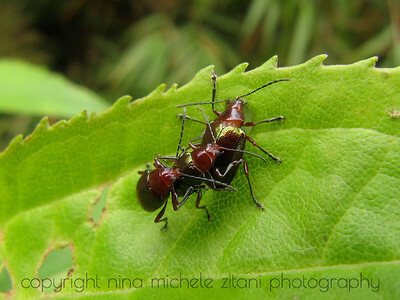 Females and males are known to mate with multiple partners, and associations during copulation may last for hours or even days. The larger individual feeding is the female. These two unrelated moths would not normally associate with one another. A light trap the night before this photo was taken brought them together. 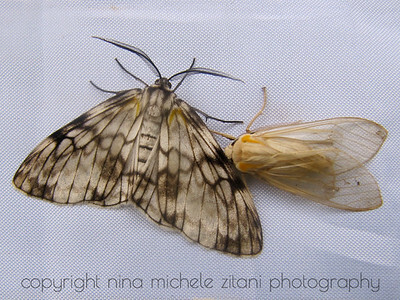 The moth on the left is in the genus "Fulgurodes", subfamily Ennominae, family Geometridae, while the moth on the right is in the family Erebidae. 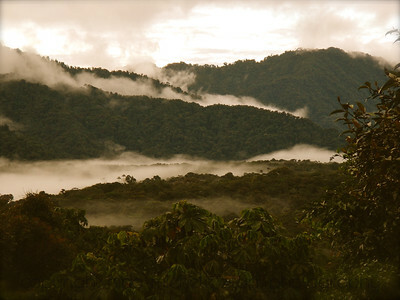 Visit the cloud forest if you want to experience the Amazon rain forest but can't take the heat of the lowlands. 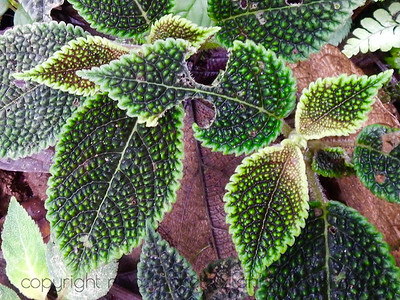 Cloud forest biodiversity is spectacular, and its warm-cool and wet, but never stifling hot. 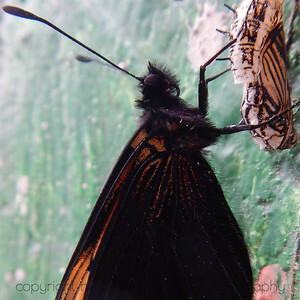 A butterfly has just emerged from its chrysalis, and remains perched on the old exoskeleton while its wings fully expand. "Actinote" sp., family Nymphalidae. Mimicry takes many forms in nature, here a moth mimics a bee. During my seven field seasons working in the cloud forests of Ecuador I have seen this moth species only once (Order Lepidoptera, family unknown). The characteristic inflorescence of a bromeliad (family Bromeliaceae), with many small flowers on long stalks. 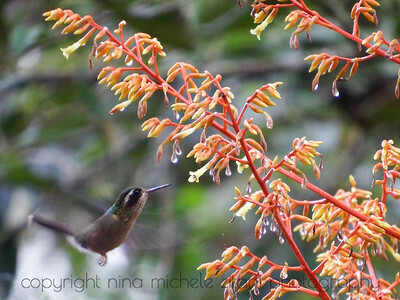 Nectar inside the flowers provides fuel for a speckled hummingbird ("Adelomyia melanogenys", family Trochilidae). The large, palmate leaf of a Cecropia tree is a symbol of the neotropics. Various species of Cecropia trees are common edge species throughout the Amazon basin, from the cloud forest down to the lowlands. They provide food and a home to many animal species from insects to sloths to primates. "Cecropia" sp. ; family Cecropiaceae. 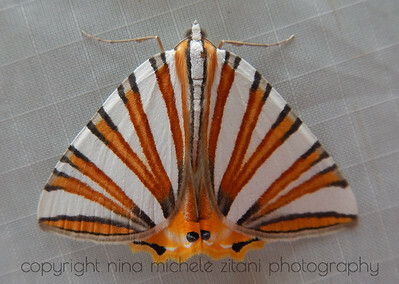 The moth family Geometridae is astonishingly diverse with thousands of species in tropical America. This species is "Pityeja histrionaria" (subfamily Ennominae). Light trap at Yanayacu Biological Station and Centre for Creative Studies, Ecuador. 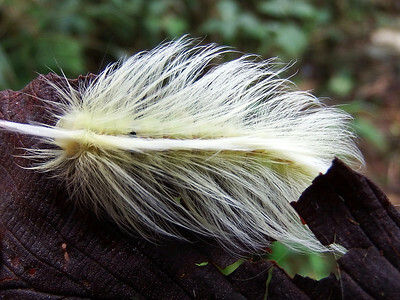 It is always wise not to handle a caterpillar with long hairs that appear soft and silky. 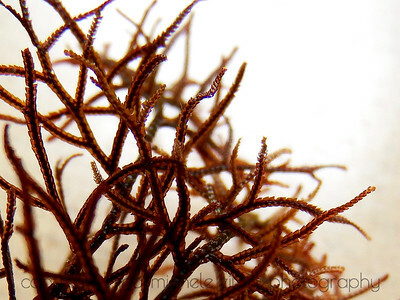 There may be shorter, stouter hairs that secrete toxins hidden from view. The caterpillar will eventually metamorphose into a harmless moth; in the meantime it is well-defended from the myriad creatures that want to eat it. The longer, non-toxic hairs also help prevent parasitoids from laying eggs on or in its body. Male fawn-breasted brilliant hummingbird with the tip of his tongue sticking out. 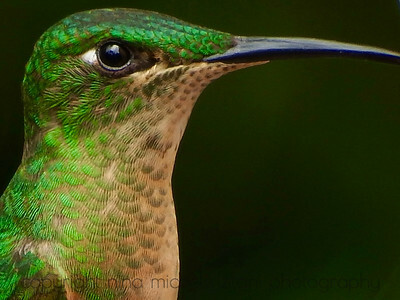 Behind a branch, the way we see most birds in the Amazon rain forest. "Heliodoxa rubinoides", family Trochilidae. A tiny arachnid finds a home behind the petal of a tomato relative in the genus "Browallia". 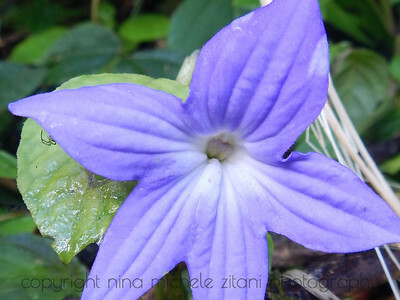 This herbaceous plant is a fairly common ground-layer species in the Amazon cloud forest. The flower is about 2 inches across. Family Solanaceae. 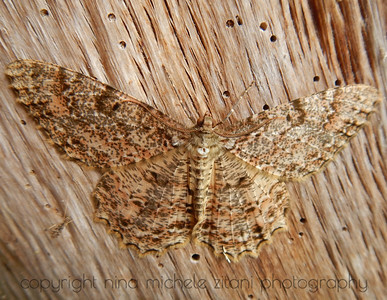 This geometrid moth, like most moth species is active at night and roosts during the day. When disturbed it will move its wings slowly up and down, resembling a dead leaf swaying in a gentle breeze. This species has evolved to look and act like a dead leaf in order to avoid being eaten by other animals. Mimicry abounds in the Amazon rain forest. Many species of harmless insects have evolved to look like harmful species in an attempt to ward off potential predators. This species of erebid moth (genus "Cosmosoma") resembles a stinging wasp. It is one of the more common species I've encountered at cloud forest light traps. Yanayacu Biological Station and Centre for Creative Studies, Ecuador. The plant is a young "Chusquea" , the only native bamboo species in this part of Ecuador. 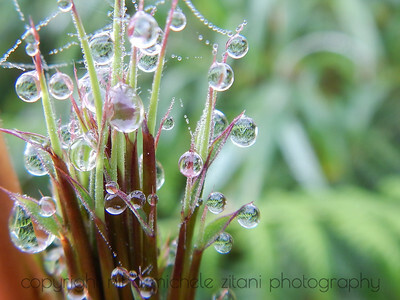 The water droplets at the tips of the new leaves are a result of guttation, released by the plant when it has taken in too much water ("Chusquea" sp., family Poaceae). Chesnut-breasted coronet ("Boissonneaua matthewsii") flying in front of a fawn-breasted brilliant ("Heliodoxa rubinoides") male, identified by the throat patch. 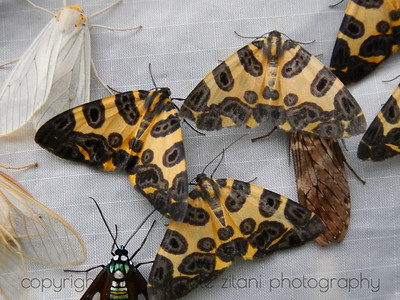 These moths were lured to a white sheet with a bright light the night before this photo was taken. The yellow and black-dotted moths are in the family Geometridae, subfamily Ennominae, genus "Pantherodes". 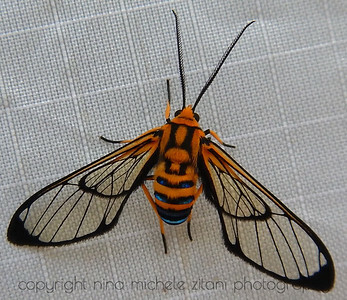 The other moths are in the family Erebidae, and one of them is a wasp mimic. There are several hundred species of neotropical green moths in the family Geometridae, subfamily Geometrinae. Many have a blue-green or yellow-green colour to their wings hence the common name "emerald moths". 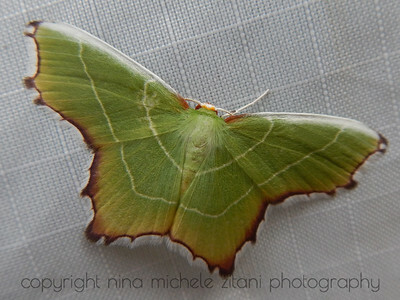 This moth is probably in the genus "Synchlora". Photographed in the morning at a light trap. 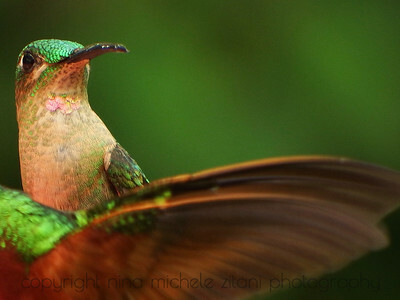 The female fawn-breasted brilliant hummingbird is recognized by the absence of a throat patch. "Heliodoxa rubinoides", family Trochilidae. 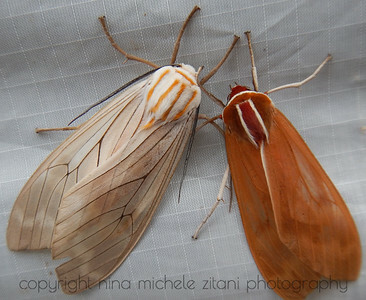 These two different moth species in the family Erebidae would not normally associate in this way. A light trap the night before this photo was taken brought them together. 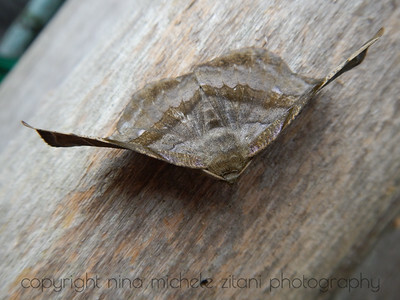 A large geometrid moth species roosts on wood covered with holes made by wood-boring insects. A member of the genus "Epimecis", species in this genus are some of the largest geometrids (subfamily Ennominae, family Geometridae). 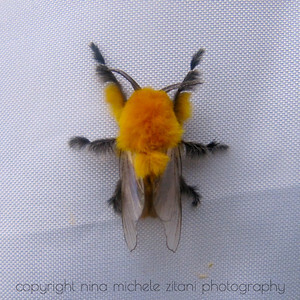 The striking comb or feather-like antennae suggest it is a male. 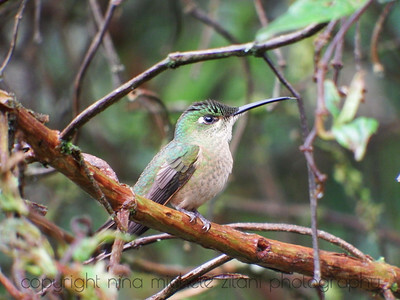 The fawn-breasted brilliant hummingbird is one of the more common feathered dinosaurs in this part of the cloud forest of Ecuador. 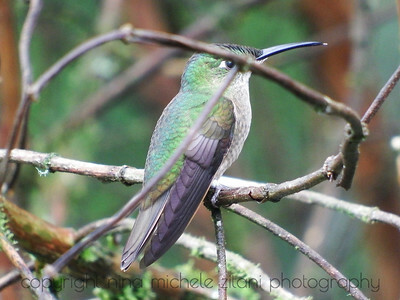 The female (pictured) is distinguished from the male by the absence of a throat patch, or the absence of a darker patch of feathers under the beak ("Heliodoxa rubinoides", family Trochilidae). 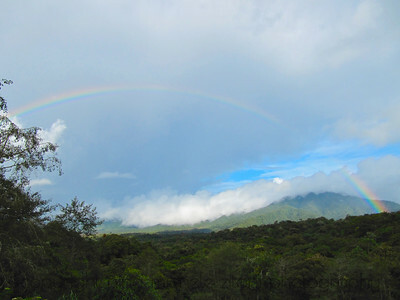 If you spend time in the Ecuadorian cloud forest you should run into a rainbow, or two.